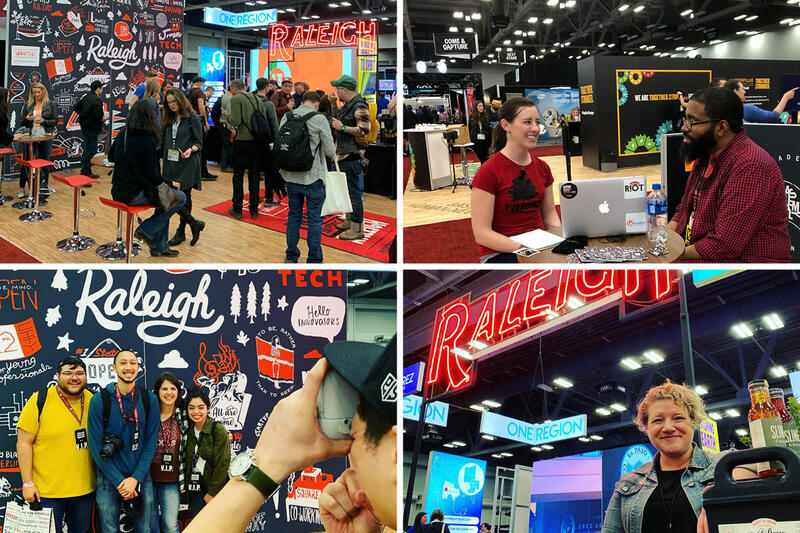 The story of Raleigh, N.C., at South by Southwest (SXSW) 2019 is one of collaboration. We talk about Raleigh being “a city that prides itself on our collaborative spirit,” which I suspect many cities say about themselves, but not so many do. You might have seen tweets and Instagram posts last week from Wake County Economic Development (WCED), the City of Raleigh and some of our participating allies, featuring a striking, black-and-white mural graphic with a chubby "RALEIGH" in the center and a series of hand-drawn images surrounding it. 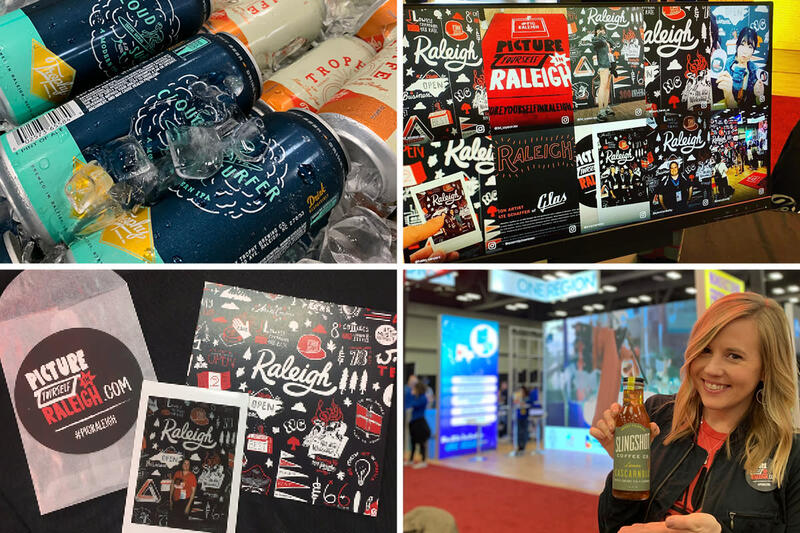 That image was the result of an epic collaboration between multiple partners—all of whom have at least two things in common—we love Raleigh and we like bragging about it. A team of representatives from this year’s three participating organizations (GRCVB, City of Raleigh and WCED) started meeting last fall to talk about what this year’s activation might look like. We knew early on that we wanted to communicate three key concepts—(1) that Raleigh prizes diversity and inclusion; (2) our area is fertile ground for tech companies and (3) we embrace startups and entrepreneurs. If you were downtown for First Night Raleigh on New Year’s Eve, you probably spotted a luminous, neon "RALEIGH" on the balcony of The Dillon—that was the work of Nate Schaeffer. We asked Nate, who said he would be willing to transport that same neon sign to Austin for us. You also can’t help but notice a virtual gallery of murals around Raleigh, and many, if not most, exist because of the behind-the-scenes work of Jed and JT. We regaled them with our story of what we wanted to accomplish and sent them off to come back with ideas. 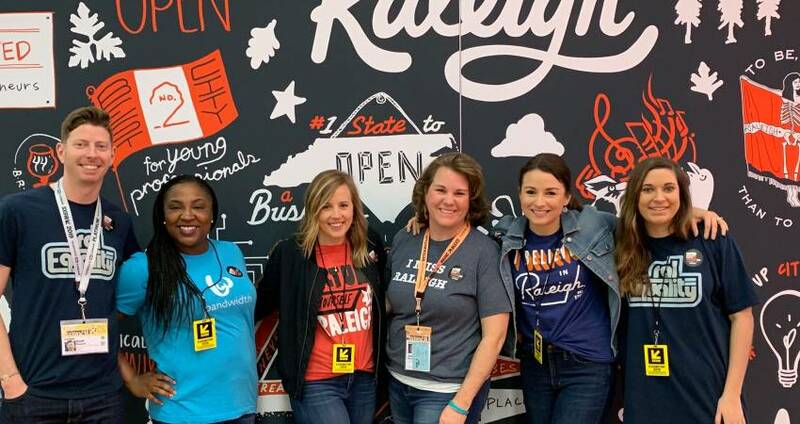 They researched and did some dreaming of their own and returned with several iterations that we could use to communicate Raleigh’s message at SXSW. From the options that Jed and JT pitched, we saw one particular artwork style that caught our attention, to communicate our uniquely Raleigh message. But who to turn to, to create it for us? The Assembly is a consortium of incredibly talented artists and illustrators who work together in downtown Raleigh. It was The Assembly who designed the City of Raleigh’s new logo and Gino Reyes who ran point on the project. The SXSW team generated a long list of superlatives, accolades and qualities that we wanted to highlight about Raleigh as part of a new piece of art, including the three original concepts we had talked about at the beginning—inclusion and diversity, a tech-savvy climate and a culture that embraces entrepreneurship. The team at The Assembly took that list, and 13 separate artists contributed hand-lettered imagery to illustrate those concepts for the mural background. Once we signed off on The Assembly’s artwork, it came back to us at GRCVB, and we turned to one of our tradeshow vendors for the manufacture and fabrication of the hardware and the mural. In the meantime, the SXSW Raleigh planning team continued to work on a theme that we could use to tie these elements together. We wanted a way for booth visitors to interact with the artwork, to have something to take with them and to share on social media. 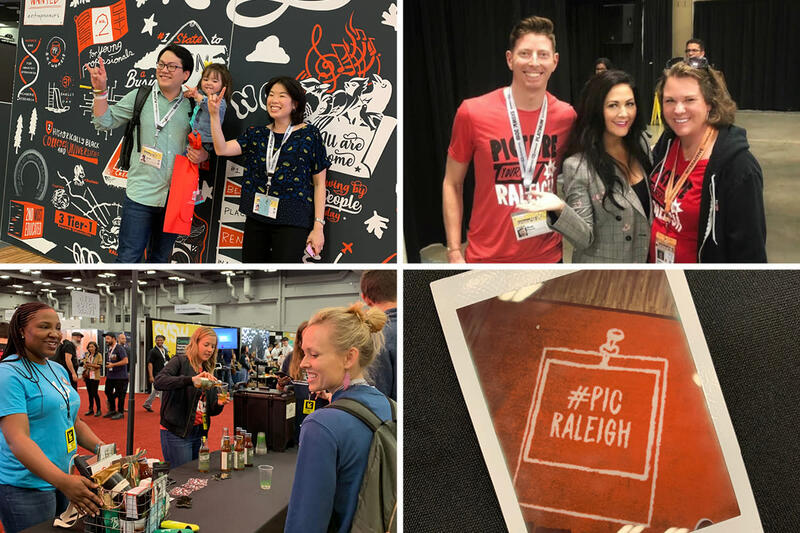 We settled on the concept—“Picture Yourself in Raleigh.” Our on-the-ground team then took Polaroids of booth visitors with the mural, which they, in turn, hashtagged using #PicRaleigh and posted them on social media. Booth visitors also got to take the Polaroid home. In addition, two of Raleigh&apos;s most successful entrepreneurs, Jenny Bonchak, founder of Slingshot Coffee Co., and Christopher Powers, co-owner of Trophy Brewing Company, served samples of their respective beverages to show attendees. Only time will tell what connections and long-term impressions were made. But don’t be surprised if, sometime in the near future, we hear of a major company either moving here or a new startup putting down roots in Raleigh. And before that, we anticipate many visitors who will want to see first-hand what the hubbub is about.